God wants us to realize that we are works of art in progress, and we, as leaders—church leaders, small group leaders, teachers, parents, etc.—can envision others with this truth. I am fortunate that several people in my life took the time to help me see beyond my present circumstances to something better. God used to them to transform me into what he had in mind for me in his plan for my life. Allow me to share my own personal experiences. School was a chore for me. I was always the youngest and smallest kid in my class. It started in Kindergarten. I had not fully developed my language skills yet—even my mom didn’t understand half of what I said. My Kindergarten teacher was a Chinese nun who herself had not mastered English. Mom understood less than half of what she said. (Somehow my teacher and I understood each other perfectly well, but no one else could understand either of us!) My teacher and I got along great, but when the year was over, I was not even close to being ready for first grade. In fourth grade I endured several social embarrassments, including having my pants rip up the entire inseam while playing football on the playground. This freak accident happened twice in two weeks. In sixth grade, I discovered I had diabetes, and missed three weeks of school. When I returned to classes, I had to leave class twice a day to get a snack. Doctor’s orders. My friends treated me like I was “different,” and my teachers did nothing to help educate my classmates about the disease. I struggled academically and socially through school until eighth grade when two important events took place to change the direction of my life. The first happened at home. Mom owned and operated a custom drapery shop in the basement of our home. She employed about four other women in the shop, all of whom became like extended family to me. The second positive thing that helped change my life happened in school. It was math, the subject with which I struggled most. I had a Chinese teacher, Mrs. Li, who knew very little English. “Here we go again,” I thought. My first couple days in class were like a terrible nightmare. I’d become sick just thinking about going to class. Mrs. Li had a lot of difficulty keeping control of the class. She even had her military-regimented husband come in one day to scold us for our misbehavior. We were moving through the math textbook at a clam’s pace and learning nothing. About a month into the year, two of my friends, Paul Augustine and Dale Trebor, went to Mrs. Li and suggested they do an independent study through the textbook. She agreed, and they asked me to join them. Each day we worked through the textbook ourselves. If we came across something we didn’t understand, we tried to work it out ourselves, and if we really had trouble, we asked Mrs. Li for help. When one of us got stuck on a concept (this was algebra), the other two stopped to help him figure it out. None of us moved on until all three of us got it. When we finished one textbook, Mrs. Li got another and let us advance. At the end of the year, Paul, Dale, and I had worked our way through three and a half textbooks! The rest of the class had not even finished the first, with very little comprehension. If you were to ask my friends and co-workers for a reference on me today, they might say a couple positive things about me.. First, I’m a creative, big-picture thinker. I’m good at seeing a problem and coming up with creative solutions. Secondly, I’m pretty good with numbers. After my “small group” experience in eighth grade, I went to a private college-prep high school and tutored other kids in algebra. You see, I was given a vision of what I could be, indeed, in what I truly was. I am not the short kid with speech and math impediments. God worked through those painful times in my life to develop something inside me that only he could bring about. And, in his design, he used others to envision me with his plan for my life. My mom used encouraging words to bring out something good in me—something good that God had created in me. She saw it, helped me to see it, and then helped me become it. She was God’s instrument in his process of transforming my life. Paul and Dale included me in their community with a purpose. I believe this was my first small group experience! Together, we spurred each other on and, in the process, really connected with each other. We challenged one another and were patient with each other as we moved together to become something better. God created every person as a unique work of art in his creation. God’s plan is for us to realize this and live it out. But we do not always see the beauty and purpose within us. Leaders have a special privilege of helping people see, understand, and live out the purpose God has created within them. It is God’s plan to use his people to encourage one another and spur one another on to what he wants us to be. He wants this for our lives because he loves us. Adapted from Chapter 1 of my book, Leading from the Heart: A Group Leader’s Guide to a Passionate Ministry, published in 2001 by TOUCH Outreach Ministries. 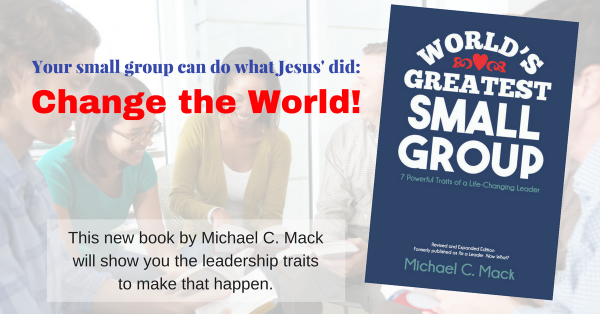 Previous article Return of the Small Group Leadership Blog!